Many of you may remember my last blog post (or you can read it here) about all of the fantastic things I discovered I could make in my awesome fermenting crock. In the few months since I have had the crock and have been researching cool things to make in it, I discovered two very important things. 2) Alcohol is technically a fermented food. Yeah. I know. 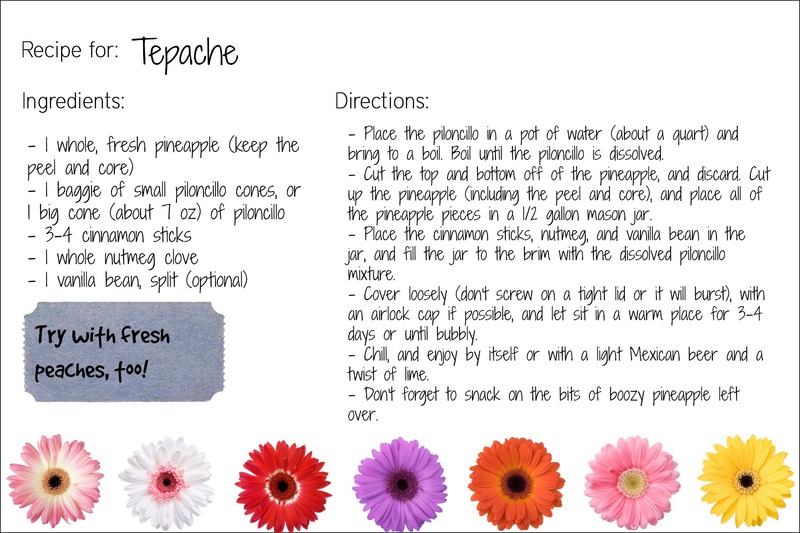 I practically found out about some drink called Tepache by accident, and then I didn’t believe that the only ingredients were pineapple and sugar. I was literally standing in my kitchen, carving up the fresh pineapple, shaking my head and thinking to myself that this was a waste of a perfectly good fresh pineapple. Luckily they happened to be on sale for like a dollar, and they were insanely sweet and fresh, so I figured what the heck. I put the chopped pineapple in my crock, with the peel and core and all. Not the spiky part on top, though. I simmered in a few cups of water (depending on how big your vessel is, see below about what sort of containers you can use**) with some piloncillo (again, adjust this to your tastes, how much you are making and how sweet that pineapple is) until the sugar had dissolved. Then I waited until it cooled and poured it into the crock. 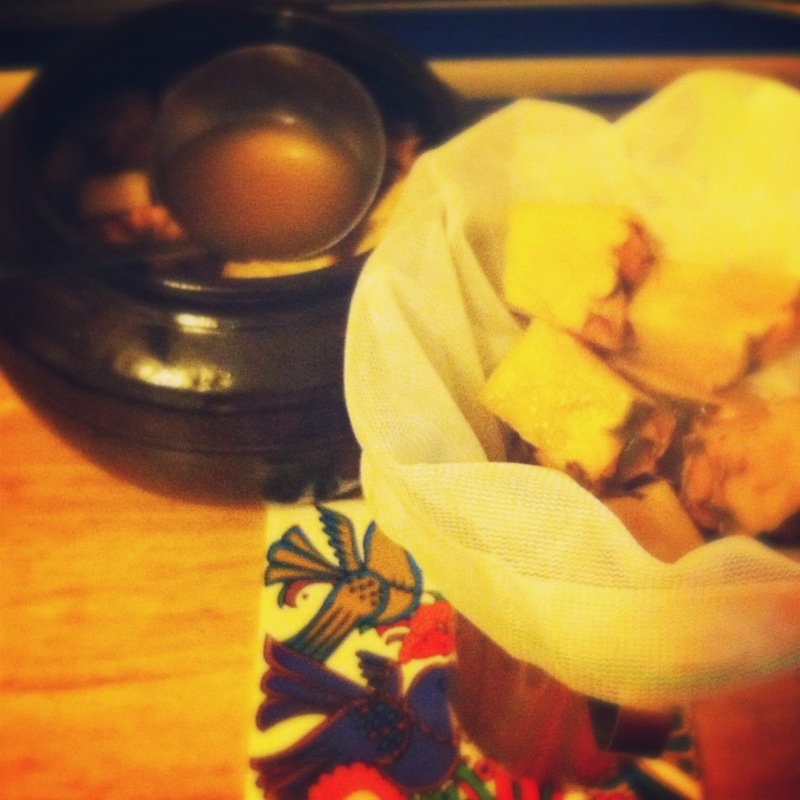 I added a cinnamon stick, a nutmeg seed and a few whole cloves to the crock as well. Four days later, it was bubbly, foamy, and smelled like booze. I strained out the fruit (oh yeah, keep it for a garnish or something, cause it’s pretty boozy, too) and ladled it into a few jars for easy serving. It was delicious! Especially in early summer in southern California, all of the ingredients for tepache are readily available and pretty darn cheap. 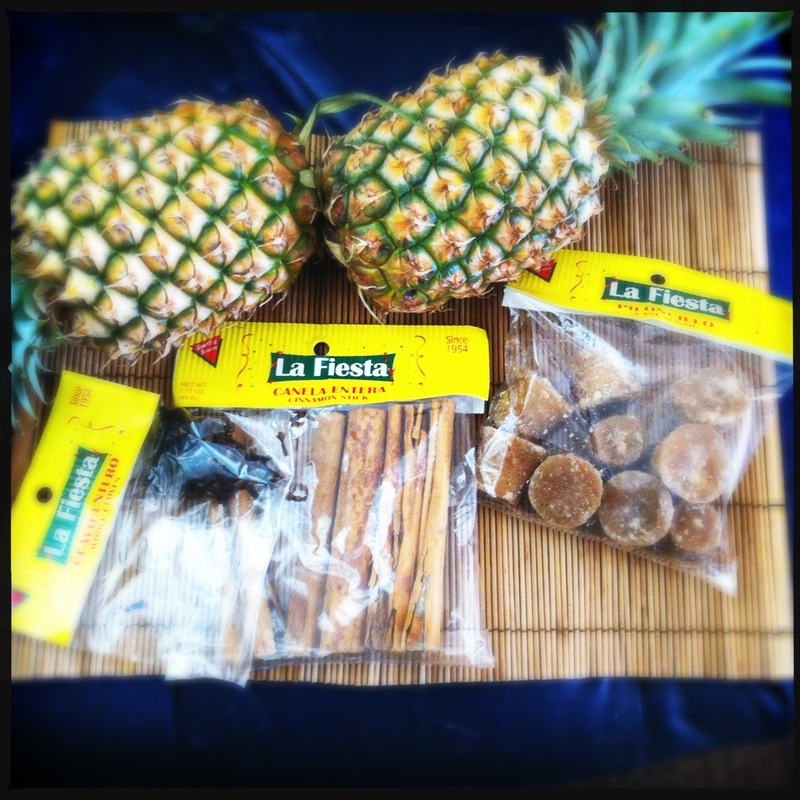 I found the fresh fruit for about $1 each, and those packets of piloncillo and spices were about a buck each. I should point out here that there are literally hundreds of different ways to make this. A lot of people only use the pineapple rind and core but not the soft fruity part — personally I like it better with the fruit, so I can eat the yummy fruit later. It’s wonderful. You can also add spices — the first time I made it, I went a little too heavy on the whole clove (it can be a little overpowering if you’re not careful), and so I had to adjust the spices. But I definitely recommend one or two whole cinnamon sticks, and a whole nutmeg seed, too. 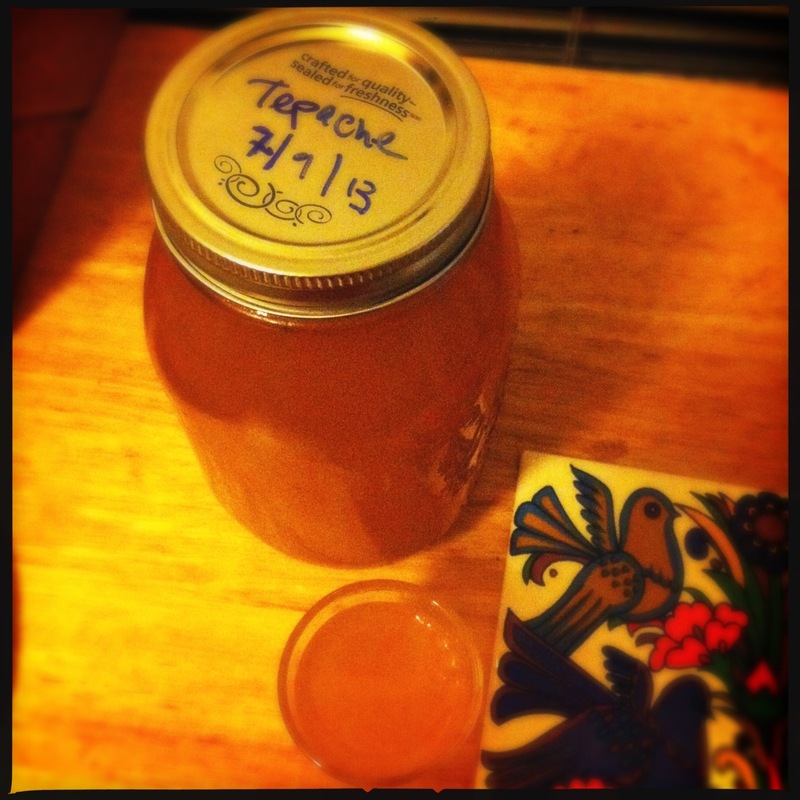 The first time I made tepache, it took four days to be fully bubbly and ready (your nose will know). The second time, it was considerably warmer in my kitchen and the fermenting process only took three days. Just keep an eye on it and if it looks like it’s fermenting too fast, move it to a cooler spot. 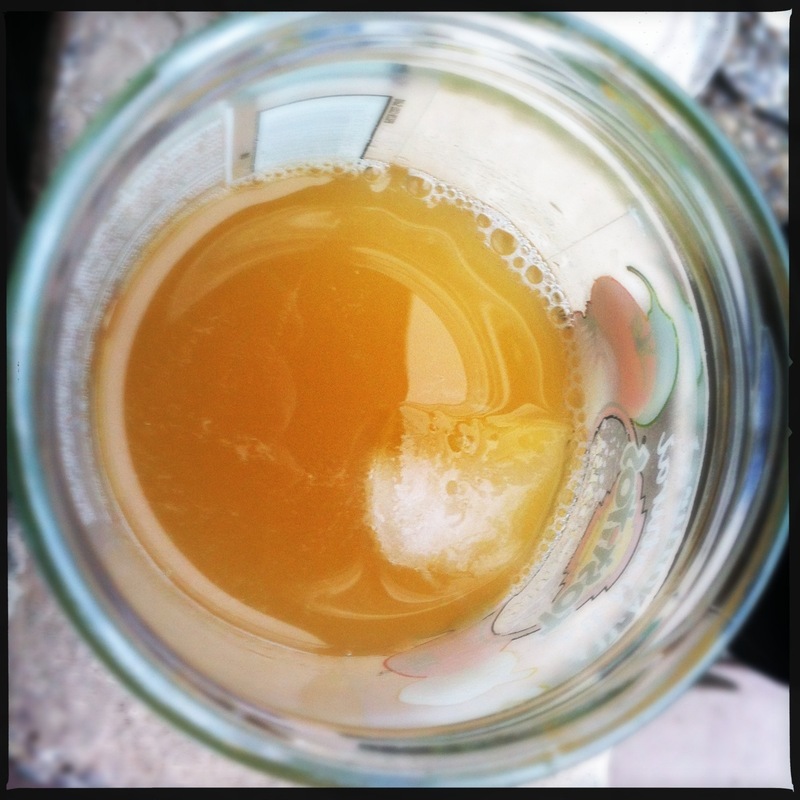 I also found some recipes for making tepache by only fermenting it for two days, then adding beer to the mixture, letting it sit one more night, and then drinking it immediately. It just speeds up the fermentation process to add the beer, so do it if you need to, but otherwise, there is no need to rush it. I also tried it once with one of those big, juicy, fresh peaches chopped up along with the pineapple and spices and sugar. It had a distinct peachy flavor and it fermented a little faster, in three days instead of four. I assume that had to do with the additional sugar from the peach. I used my awesome fermenting crock, but there is no reason you can’t make this with a regular mason jar. Of course, you’d need a pretty large one, or several smaller ones, and make sure that the fruit, spices and sugar/water mixture is evenly distributed among all of the containers if you use more than one. If you use a mason jar, don’t seal it completely — cover the lid with a cheesecloth, or put the two-piece lid on the jar but don’t screw it in and let it sit loosely. In 3-5 days, you’ll notice the foam. This drink is delicious by itself, but it’s perfect for a hot summer day, over a glass of ice, mixed with a light Mexican beer (Tecate or Pacifico, etc. ), and with a twist of lime. 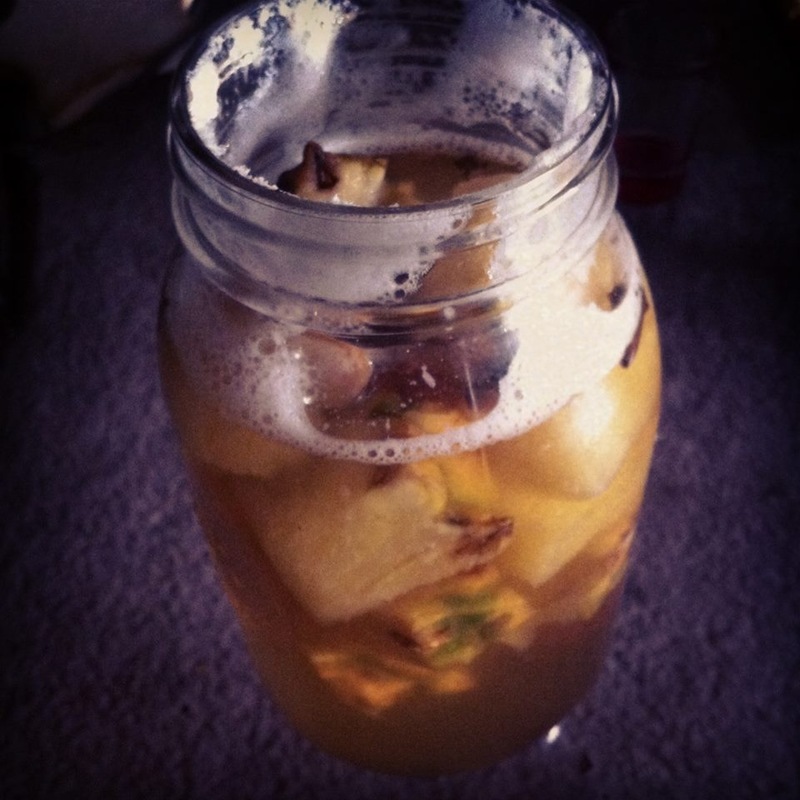 This entry was posted in cooking, fermenting, food, holidays, Uncategorized and tagged beer, fermenting, mason jar, pineapple, pineapple beer, tepache. Bookmark the permalink. Fit Foodie 5k 2018 -and a Giveaway! Low Carb Chicken Tetrazzini – and a giveaway! The Fit Foodie 5k is tomorrow!